The closed-molding process of thermoset materials known as Resin Transfer Molding (RTM), was utilized and perfected by Osborne scientists and engineers in the 1970s, before the industry even had a name for it. With 45+ years of experience in RTM manufacturing, trust Osborne to provide turnkey guidance of your next project: from concept to prototype to final product, and from patterns and molds to final inspection. Osborne-made RTM tooling is far more economical when compared to compression tooling. Superior quality and efficiency quickly repay the added invest in Osborne-made RTM molds when compared to simple open molds. Osborne can match production capacity to your largest projects. 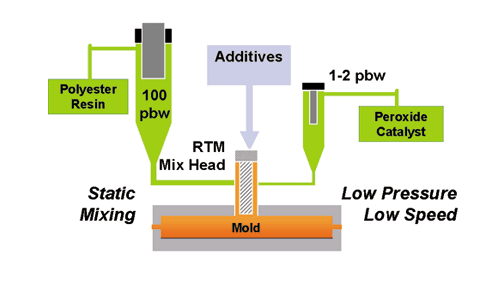 Resin Transfer Molding (RTM) is commonly referred to as liquid molding. With this process, a resin is mixed with a catalyst (hardener) and injected into a mold that contains dry fibers, such as fiberglass. A static mixer regulates the ratio of polyester resin to catalyst. Usually a ratio of 100:1 of resin to catalyst is used. The mixture is then injected at a low pressure of approximately 5 psi into the mold. The reaction time is usually minutes. We operate and maintain a full range of RTM molding equipment, providing our customers with the assurance and confidence that their project will be completed on time and on budget. An efficient, natural transition from prototype to high-volume production. A low-cost path to commercial parts compared to high-cost tooling for compression molding. Quick repayment of the added investment in RTM compared to simple open molds via superior quality and efficiency. Completely equipped secondary trimming and finishing department. Two (2) 5-axis CNC routers with twin beds, with a maximum capacity (x,y,z) of 12-ft x 6-ft x 48-ft. Structural bonding and assembly services. Completely equipped quality assurance laboratory.